5" Aluminum Expansion Box for 5" Extruders. Cast Aluminum. Output dimension 8 inches by 8 inches. Made in the U.S.A.
5" Expansion Box Wooden Die Kit for 5" Extruders. Marine grade plywood inner and outer dies to make circle, square, and hexagonal shapes. Extrusion wall thickness 1/2". The Wooden Dies will produce 7 1/2" diameter extrusions. 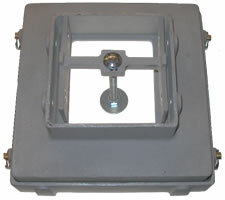 Use of this Die Kit requires the 5" Aluminum Expansion Box. Made in the U.S.A.